UNITED NATIONS, January 3, with updates -- With Israel's ground offensive into Gaza having begun, the UN Security Council began an emergency meeting on Saturday night. Libya on behalf of the Arab Group circulated a draft three-paragraph Presidential Statement calling to a ceasefire. The Council's new President, France's Jean-Maurice Ripert, was asked if he thought the draft was similar to the press statement read out last Saturday. There's a significant difference, Ripert indicated. The Libyan draft does not mention Hamas or rocket fire. UK Ambassador John Sawers said he would comment later. A US spokesman passed out a statement by Scott McCormack and said, "That's our bottom line." Ban Ki-moon's spokesperson went in with Ban's chief of staff Vijay Nambiar, but Ban was not yet seen. The General Assembly President Miguel d'Escoto Brockmann appeared at the stakeout, fresh back from Nicaragua, and denounced the ground offensive and the "disfunctionality" of the Security Council. Inner City Press ask how he would review the performance of the UN Secretariat, a question which d'Escoto dodged by saying, "I do not speak for them." Then a representative of Fox News repeatedly asked questions about why d'Escoto is targeting Israel. A self-described Jewish correspondent asked about the terror in which Israelis live. A new columnist for the New York Post asked d'Escoto, "who invited you to the Security Council?" D'Escoto did not answer, but from the riser of TV cameras, an Arab journalist said, "It's none of your business." Then the Postie debated an Arab cable channel. 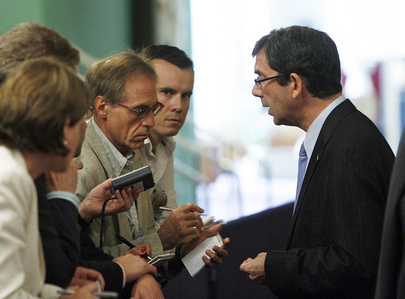 The conflict had spread not only to the Security Council but to its stakeout and press corps. The ground offensive had begun. Update of 7:50 pm -- As d'Escoto came out of the Council, he approached Inner City Press. "I'm going to take a rest," he said softly. Inner City Press asked him if he's spoken with UN rapporteur Richard Falk since he was barred from the Occupied Palestinian Territories. "We are in touch," d'Escoto said. "Do you know where he is?" Update of 8:38 pm - Council goes into recess to re-work the Libyan draft, Presidency indicating that reference to rockets will go in, and that d'Escoto was not invited to the consultations, "which technically do not exist." PGA d'Escoto's spokesman tells Inner City Press, on the record, that as PGA d'Escoto can go anywhere he wants in the UN, and that with 400 people dead and a military attack going on for one week, discussing whether to wait for an invitation" is ridiculous. He added,"Nothing's going to come out of the Security Council." But during the recess, two Western Council member spokesmen said a statement is coming along, with extra issues to be included being arms smuggling, Palestinian reconciliation, humanitarian access and border crossings. We'll see. Update of 11:07 pm - US Ambassador Wolff comes out to take questions, emphasizes Hamas rocket fire. Inner City Press asks him, since UNRWA's Karen AbuZayd said the killed police cadets only went to work for Hamas government because they had no jobs, were they legitimate military targets. I'm not going to get into specifics, Wolff says, blaming it all on Hamas. But what is a legitimate target? To be continued. The Libyan Ambassador, speaking mostly in Arabic, predicts an open Council meeting on Monday. Update of 11:30 p.m. -- in the penultimate stakeout interview of the night, Egypt's Ambassador denounces the UK for having alleged weapons smuggling from his country into Gaza. He says he will write a letter to UK Ambassador Sawers. Sudan's Ambassador speaks last, and only in Arabic. And it's a wrap. "We had extensive talks on the situation in Gaza. I must tell you that there was no formal agreement. In my capacity of President of the Council, I have noted very strong convergences. Serious convergences to express serious concerns at the escalation and the deterioration of the situation in Gaza and southern Israel. Serious convergences on a call for an immediate, permanent and fully respected cease-fire. Serious convergences on a deep concern about the humanitarian situation in Gaza and the need to ensure free access for humanitarian supplies and on a call on all parties to protect the civilian population. Serious convergences on a full support for the regional and international diplomatic efforts underway to help resolve this crisis. Serious convergences on the urgent need for Israelis and Palestinians to continue negotiations for a comprehensive solution, as envisaged in Security Council resolution 1850." And after the meeting and the stakeouts ended, from within the Council came the sound of the final plays of the US National Football League wild card game between the Indianapolis Colts and San Diego Chargers. There was cheering, and then the US spokesman emerged. He said to Inner City Press, "Chargers won." And that just about sums it up.